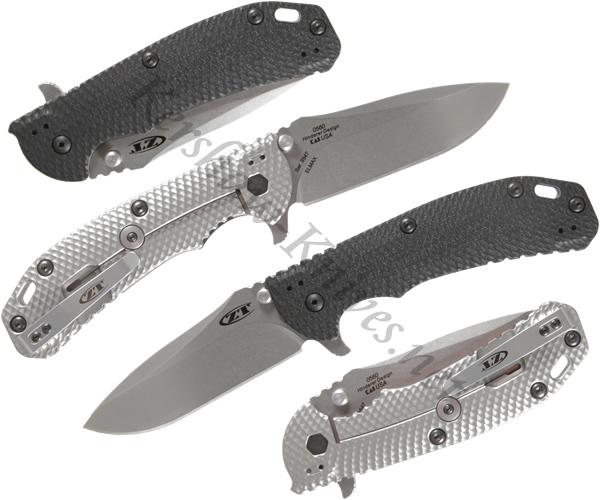 The Kershaw ZT Hinderer 0560 knife has a corrosion resistant, wear resistant ELMAX powdered steel blade in a stonewashed finish. The handle is titanium that has a stonewashed, 3D machined pattern on the back and a matching black, G-10 3D machined scale on the front. The handle has a generous finger guard and grip. Ridges along the top of the handle extend into the blade for greater control of the knife. The blade is opened with the flipper or dual thumb studs. A KVT ball bearing system ensures smooth, fast deployment. The Kershaw Zero Tolerance Hinderer 0560 comes with a deep carry pocket clip that allows for left or right carrying with the tip up or down.